This is a sponsored post written on behalf of Enbrighten Color Changing Café Lights. I’ve been wanting to do something with this deck for years, but never got around to it. I’d paint it then tell myself, I’d decorate it, but it never happened. For years it was used as my kids’ outdoor playroom or sorts, but they are teens now. No longer do I need to fill this deck with their kiddie pools and sand boxes. I can actually turn it into a space where me and my husband can relax or have game night with the kids. 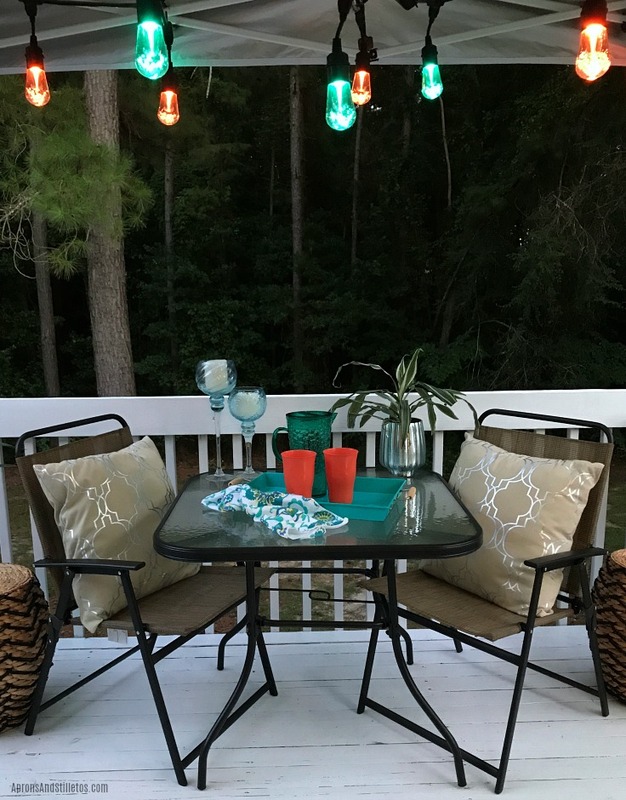 Now that my kids are all teens, I stopped making excuses and turned my deck into a useful outdoor entertaining space. To kick off this project I started by painting my deck with ultra white deck paint. It only took one coat because I splurged on the paint with primer. Since this is my upper deck which is uncover, I erected a shade canopy to make sitting out here in ninety degree weather bearable. I plan on using this space at night as well, but the only light out here doesn’t give off much illumination. To bring in more night time light I strung Enbrighten Seasons Color Changing Café Lights through the frame of the shade canopy. I linked two 24 ft. strings together for this space, but if you have a bigger project, these are linkable up to 750 feet. Once the lights were strung I plugged the Enbrighten Color Changing Lights into the myTouchSmart Timer. I set the timer to come on at dusk every evening. I feel like seeing the lights come on each night will remind us to use our newly decorated outdoor space. Once the sun went down, I was able to check out all of the color modes on the Enbrighten Color Changing Lights. The remote controlled bulbs can display one color at a time or two colors simultaneously. 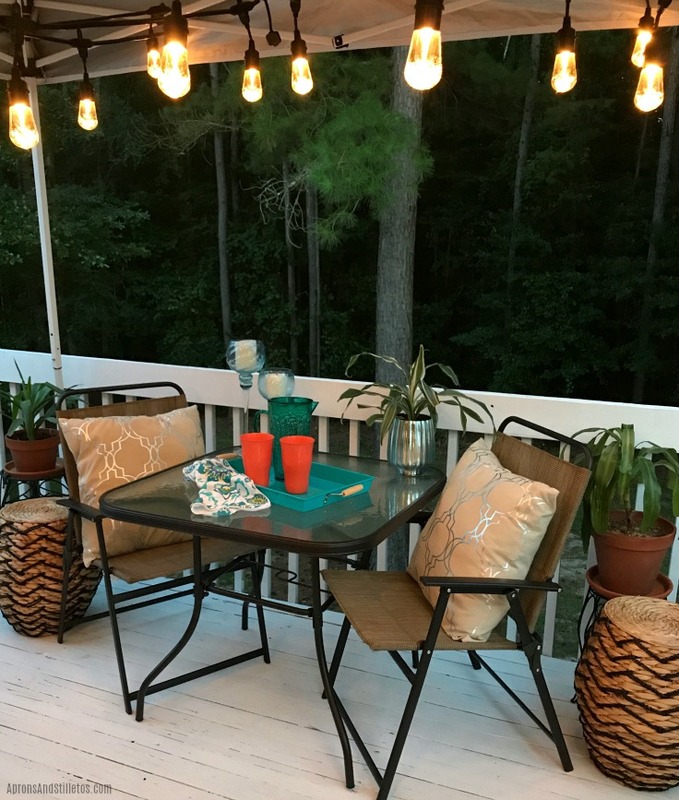 I wish I would have done this sooner, because I love how the deck turned out. 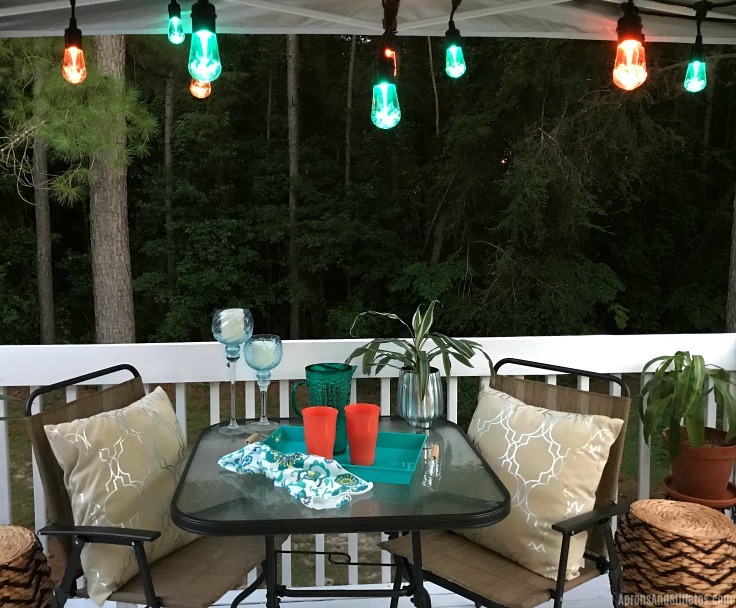 With some paint, seating and Enbrighten Seasons Color Changing Café Lights, this deck went from wasted space to a cozy spot for outdoor entertaining. To see more ways to incorporate Enbrighten Color Changing Café Lights by Jasco into your decor check out this Pinterest board. oh i love the lights, they are gorgeous! Good job, must have taken a while, but well worth it! Your space looks so beautiful and those lights are amazing. I would surely love to use few of these at my place too. Thanks for sharing. Wow! I am so inspired! I love your creativity and ability to transform your space. I’m bookmarking this post for future reference. The deck looks great and I especially love the lights. My kids are a teen and tween too..I can do something like this of all areas which were earlier used buy them. We currently don’t have a deck, but you have inspired me to install in the future. I love the coloured bulbs strung .They look so perfect.Are they difficult to put up? They aren’t difficult to hang at all just heavier than I expected. They arent light weight thin glass on these bulbs. The glass on each bulb is thick, clear and shatterproof. I love it! Our garden is on the list of things to do next year. This is adorable! I am all about a diy project and this one is def gonna be on my lisy. Hi, love the decking area. The teal accessories and coordinating lights just bring it all together nicely. I could imagine sitting out there in the evening watching the world go by. WOW. A lovely transformation! It is so amazing how little touches can completely change a look. Your outside space looks so beautiful and cozy. Seriously, pictures taken there will be instagram worthy! I love, love, love those lights! I want to get some for my outdoor terrace. It’s amazing how simple touches can make all the difference!